I received news of a TLM in Tampa. What caught my eye is that it will be at a Jesuit High School. “Jesuit High School, the Latin Mass Society of Tampa Bay, and Epiphany of Our Lord Catholic Church cordially invite you to the third annual Rorate Mass, this year to be hosted at the Chapel of the Holy Cross on December 15, 2018 at 6:30am. Fr. Vincent Capuano, S.J. will celebrate Solemn Mass for Our Lady in Advent, with Fr. Paul Mangiafico of the Diocese of St. Petersburg serving as Deacon and Mr. Steven Rabanal of the Personal Ordinariate of the Chair of St. Peter as Subdeacon. The men of the St. Dunstan Schola will present the chants of the Mass, and the boys of the Archconfraternity of St. Stephen and Jesuit High School will serve at the Altar. The Chapel will be open at 5am for private prayer and devotions. Pamphlets with the texts of the Mass will be available at the door. 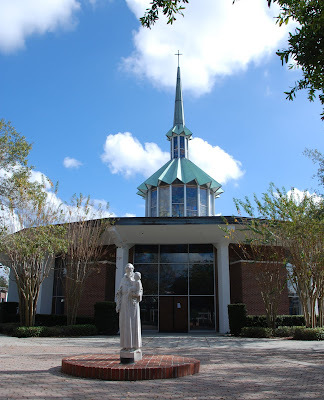 Jesuit High School is happy to host and collaborate with the community and clergy of Epiphany of Our Lord Catholic Church to host this beautiful liturgy in our newly dedicated Chapel. There is a new chapel at Jesuit High School. The old, modernist (=ugly) one was torn down and a new one was built by Duncan Stroik. This entry was posted in ¡Hagan lío!, The Campus Telephone Pole. Bookmark the permalink. 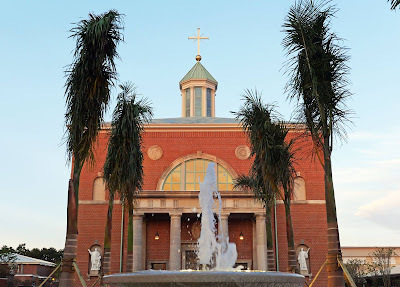 19 Responses to TAMPA: A TLM at a Jesuit school?!? That chapel is excellent. I suppose the notable point is that the leadership and a large portion of the Jesuits are tending towards Modernism and Indifferentism, a somewhat smaller but sizeable element who are orthodox, while there are some Jesuit bishops (well I heard of one) and priests who offer the Mass of Ages. More notably there is the Ignatius Press which is responsible for much good work. I know the current president of the high school, Fr. Hermes, from his days as chaplain at the Jesuit High School in New Orleans. What an incredible and holy priest, and the high school in Tampa is blessed to have him! The architect, God bless him, just lost his daughter in a tragic accident. Say a prayer for her soul, and for their grieving family. Open to contradiction on the Confraternity front, but the TLM… definitely not. But great to see the seeds being sown. AMDG. What a beautiful and uplifting post! Thank you, Father! When Fr. Ken Baker retired as Editor of Homiletics and Pastoral Review about 6 1/2 years ago, he agreed to say the TLM for us in a rented Catholic church in Tacoma, WA. Fr. Baker was there for us every Sunday and Holy Day until our Archbishop gave us the old Slovak church and FSSP sent us a full time priest. Yes, Fr. Baker did a fine job of the TLM. St. Ignatius, St. Francis Xavier, and Fr. John Hardon, pray for us and that your Order will once again be a force to spread the Catholic Faith throughout the world. 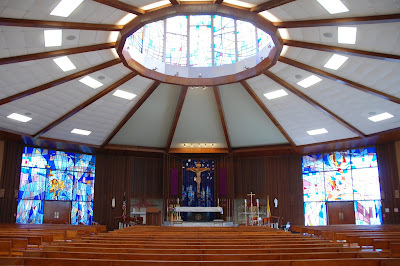 Fr says that modernist=ugly. It’s hard to argue against it. It’s even harder to understand why in the world we decided to build ugly buildings as if we were trying hard to hurt ourselves. And I don’t mean just the Church, but western society in general. The positive side is that I’ve grown to appreciate the great work demolition squads do. By taking down brutalist buildings (in particular) they do God’s work and may He bless them always! We should have a patron saint of demolition squads!!! Anyway, that aside, when I see the genuinely beautiful Churches like the one Fr highlights here, I would truly like to see the costs. I am convinced that they aren’t as expensive, in comparative terms, to the monstrosities we’ve seen erected over the decades. Sometimes, I bet those communities that can’t afford the more decorous elements of their Churches can make very respectable works by following some canons of classic architecture and just using common sense. Something as simple and humble as brick work can result in little jewels. I think it’s a question of effort and mentality, not to mention respect. On the other hand, how much did the LA Cathedral cost??? The Pope recently said that we should sell some Churches that are empty and give the money to the poor. Can we start with that demented Borg Cube that Fuksas built in Foligno?? Resistance to ugliness is NOT futile! Sorry, I meant to type churches, not Churches. 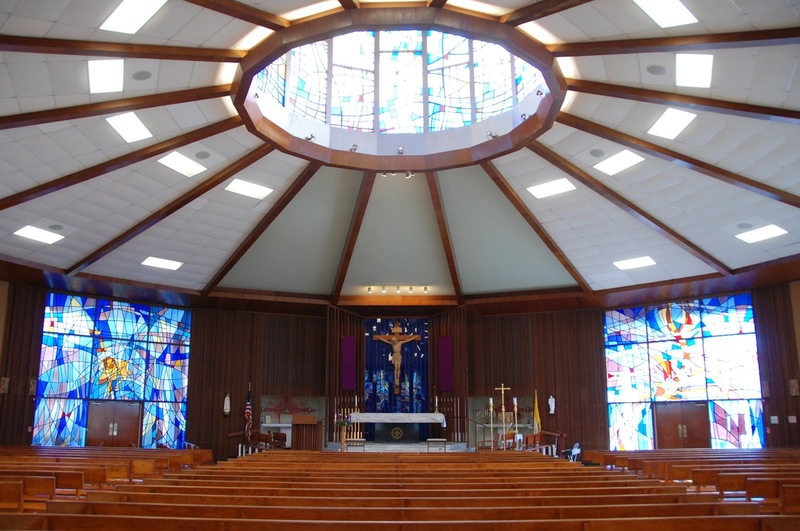 what a beautiful church, and I bet it didn’t cost anymore than it would to build the former spaceship today, you have to compare inflated dollars to get a true comparison, the old one looked like it came off the set of lost in space, Danger Will Robinson, danger!!! I was really referring to the contrast between the Jesuit fee-paying schools in Ireland and the Jesuit High School featured in this post. Not one of the schools here would be associated with the TLM in this way. Unfortunately, I misread the post to say that the Tampa school had a chapter of the Archconfraternity. Apologies. 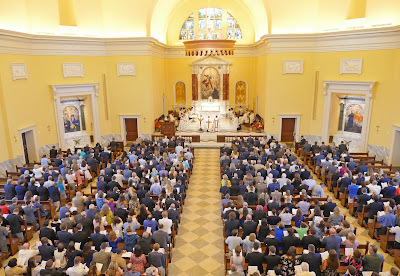 The Archconfraternity of St. Stephen has an Ireland branch, but it seems to be only connected with the SSPX. There are still good Jesuits around, even if some of them have gone crazy. Also, glitter is wonderful, Father. I saw a post on Facebook of a wedding in that new chapel. I thought of sharing it more widely to prove the very point your post makes. There are Jesuits and Jesuits. The sound ones make less noise in thr secular media but it is not about noise. This chapel and the ministry of the priests who had it built will bear fruit, fruit that will last. Big smile. Thanks for some great news. I seemed to remember this being my Dad’s high school, I emailed him and he said yes it was. I seem to remember him talking about the priests saying private Masses in the morning at multiple side altars. So the modern chapel may be from after he was a student. Their new chapel is just lovely. My dad says he was there 1959-1962.